We at Hampshire Pewter always enjoy getting new custom orders. 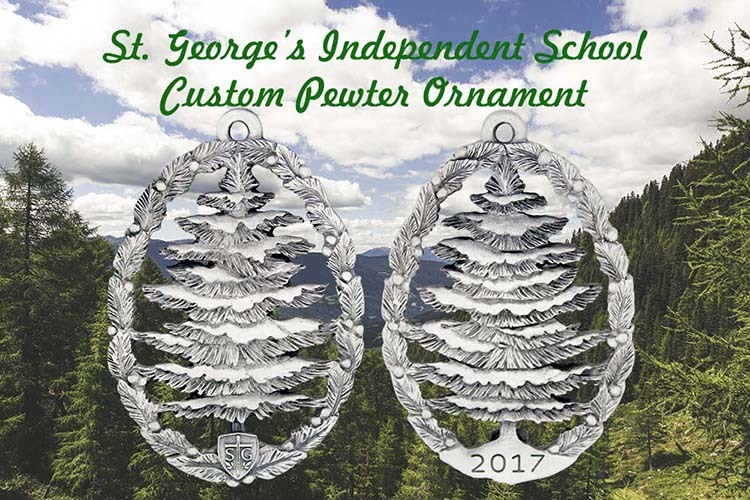 When St. George's Independent School in Tennessee reached out to us to create an ornament for them, we were more than happy to help! Click here for more information on St. George's Independent School. The custom process starts with an idea, a design, and/or a picture, and we begin discussing ideas for bringing that vision to life with our customers. The process is truly a collaboration between our clients, our artists, our pewtersmiths, and our owners, and the end result is always something to be proud of. Our process continues with the design being sculpted out of resin into a 3D model by our artists. This sculpted piece goes to the customer for review, and once it is approved, we can create our one-of-a-kind vulcanized rubber mold for the ornament. After the mold is created, we can begin hand-casting the ornaments with our specialized centrifugal casting machine. Once the ornaments have cooled to raw solid pieces of pewter, they are deburred by hand, antiqued to bring out the detailing, buffed by hand, dusted, inspected, ribboned, and packaged. All in all our custom ornament process takes around 6-8 weeks from an idea on paper to a batch of pewter ornaments in-hand. We can fast track the process for important events and deadlines, just give us a call at 866-282-7384 to discuss that option. In the case of St. George's Independent School, our specific design requirements to work into this highly detailed piece were the school's shield and the year of commission. The end result is a beautifully detailed fir tree with snow nestled in the branches, and the school's shield at the bottom. The shield features a sword between the initials S and G for St. George's. On the back, located at the bottom of the rim is the year 2017 to represent the year that the ornament was commissioned. Of all of the companies in the United States that they could have gone to for their custom order, we are so pleased that they chose Hampshire Pewter, crafters of America's Finest Pewter. We pride ourselves on the fact that we are a family-owned and operated company that has been handcrafting fine pewter gifts and usable pieces for over forty years! When you bring your business to Hampshire Pewter, you are getting the wealth of our experience, knowledge, and dedication to bringing your vision to life! For more information on our custom process click here.